Don't get rid of that old TV or monitor you have lying around somewhere. You can instantly convert it into a full Chrome OS computer for only $85 with the Chromebit from Google, a computer on a stick produced in partnership with Asus that provides computer functionality to any screen or monitor that has an HDMI port. Powered by Chrome OS, the Chromebit can turn your TV or monitor into a consumer computer. It establishes a Web browser and access to Web-based apps such as Google Drive, Google Docs and apps from the Chrome Web Store that run on either Chromebox or Chromebook such as Hulu and Netflix. Don’t expect the Chromebit to perform as powerfully as a laptop or desktop PC, but for on-the-go productivity, Web tasks and communication, the Chromebit satisfies admirably. Don’t expect it to multitask heavily or play very high-resolution videos; its Rockchip ARM processor and 2 GB of RAM simply won’t let you. But it works well for digital signage, kiosks and similar applications. The small, portable Chromebit is about the size of a candy bar, weighing in at a measly 75 grams. It offers 16 GB of built-in storage and a USB port and supports Wi-Fi (802.11ac) and Bluetooth 4.0, which you can use for pairing with a Bluetooth mouse and keyboard. Because you'll need a keyboard and mouse to use the Chromebit, your overall cost may come to more than $85 if you don't already have those input devices. Still, the Chromebit provides an enticing, pocketable and flexible way to get the Chromebook experience, although in a somewhat pared-down and less powerful way. The Chromebit is the cheapest of its kind around. In comparison, the Lenovo Ideacentre Stick 300 and Intel Compute Stick — both computers on a stick running Windows 10 — cost $99 and $135, respectively. The Chromebit will be available soon at Amazon and Fry’s. Newegg already has a product page for it, although the item is marked as out of stock. Choose from three different colors: cacao black, tangerine orange and blue. 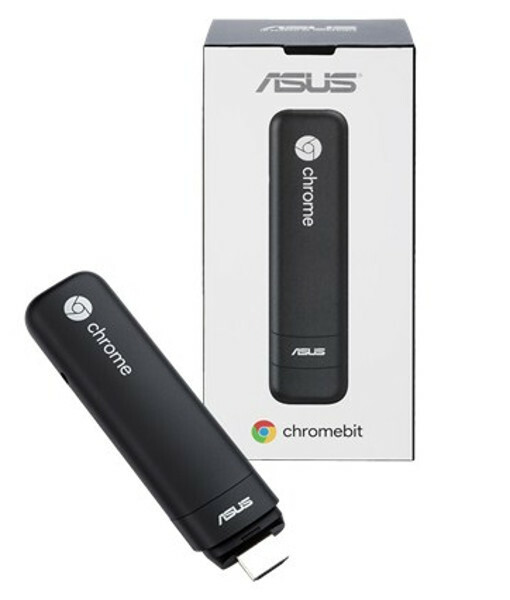 For more details about the Chromebit, see the official Chromebit page on the Asus website.